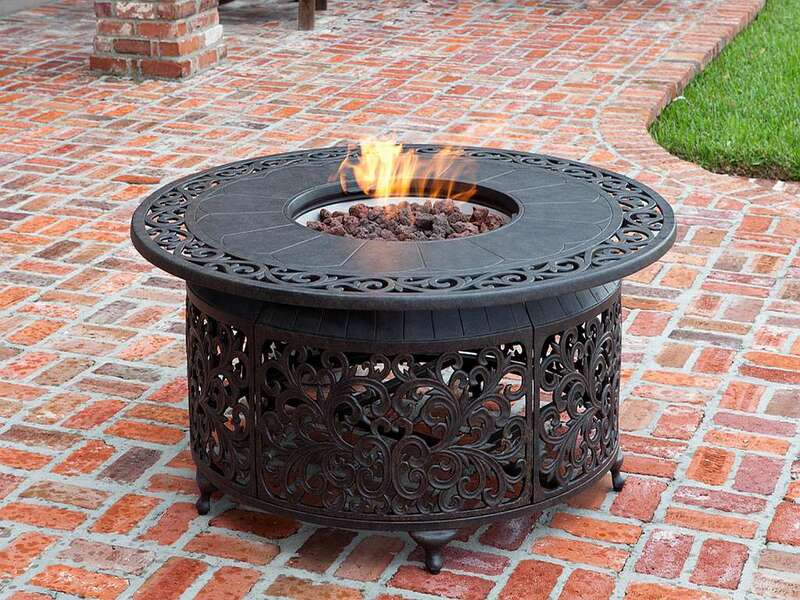 Bring beauty to your outdoor living space with the Cast Aluminum LPG-Fire-Pit-61168. 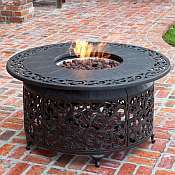 This attractive scroll design fire pit is a 40, 000 BTU unit which operates on a standard 20 lb. propane tank. The propane tank safely sits below the fire pit and can be easily accessed through a hinged door. Because of its lid, the fire bowl can also function as an outdoor patio table. The Cast Aluminum LPG-Fire-Pit-61168 is designed to keep you enjoying the outdoors all year round. Fire pits and bowls make an attractive addition to your outdoor decor. Plus, they are perfect for family and friendly gatherings because of the warmth and glow they bring to your backyard, patio, or pool area. We offer a large variety of fireplaces, fire bowls, and fire pits and are proud to carry the best in portable outdoor products to warm up winter and chilly nights. CAUTION: It is not recommended to use this fire pit on a wooden or other combustible surface or on any surface that is not entirely resistant to high heat. However, if you intend to use this item on a wooden deck, other combustible surface, or any surface that is not entirely resistant to high heat, you must use a non-flammable and heat-resistant material, such as concrete pavers, brick, or stone between the fire pit and the surface.